Moving your mom or dad to a memory care community involves a series of decisions, some easier than others. First, comes the realization that your parent can no longer live safely at home alone. Next comes the process of identifying, reviewing and making decisions on what the best environment is for them, given their particular challenges. Then you must make sure you have Power of Attorney and that you have all the documents together to support proper care for them. Finally, there is nothing left but the move itself. Take care of your health. Amidst all the preparations and emotional turmoil, it’s easy to let your own health slide. Make sure you are continuing your health regimen, whether that means taking walks, going to the gym, eating healthy and/or keeping your own medications up to date. Take advantage of opportunities to visit the community in advance of your move-in date. Many communities, such as Anthem Memory Care, hold events which are open to the public. If possible, take your mom or dad to visit. Present it as an opportunity to get out of the house and do something together. Avoid mentioning anything about move-in. The soft introduction to the new environment may help make the environment more familiar when the move-in day arrives. The less advance discussion, the better. While your instinct may be to prepare your parent well in advance for the move, it may create anticipation anxiety, which could manifest itself into anger and negative behavior in advance of the move. While you, yourself, may be very busy in preparation, try to keep your activities in the background. Choose your words carefully. There are times when softening the stark reality makes sense. As an example, you might say that you need to be away for a week or so and it makes more sense for them to stay in the community for a while. No, it’s not the honest truth, but it will help your loved one to feel less anxious about the move until he or she begins to adapt to it. The Alzheimer’s Association refers to this as using “fiblets” to make the initial hours and days of the move less harsh. Use your discretion. Surround them with familiar things. Be sure to have some familiar things in the new room prior to move-in. It is best, however, that your parent not observe you in the process of collecting and removing things from their home. Try to arrange for a visit from a friend or family member to distract your parent while you collect those items. Of course, this should be done as close to actual move-in as possible. Don’t visit for the first week if possible. 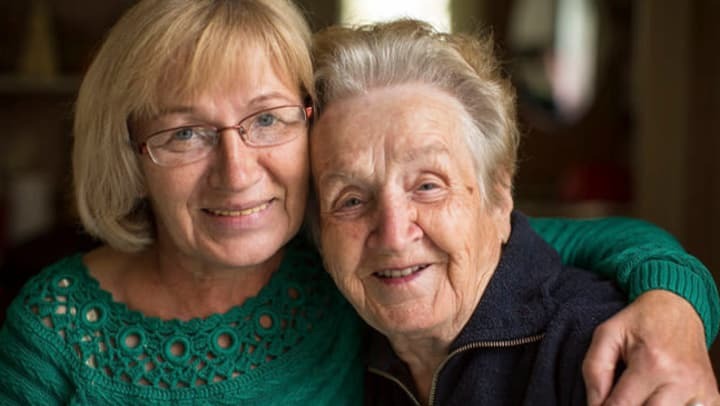 As hard as it might be, it is better for both your parent and the community staff that you give your loved one and the care team a week to adjust on their own. Of course, make sure your loved one is comfortable and that the staff is ready to take over before you leave. Reassure your parent that they are safe, they will be taken good care of and that you love them and will see them soon. Then it is time to depart and let the staff take over. While these tips can help make the move-in process go more smoothly, it is important to make all your decisions within the context with your unique situation. No one knows your mom or dad like you do. Use this as a guide, keeping the personality and emotional needs of your loved and yourself in mind at all times. Once you’ve made the move, try to stay positive. Keep in mind that your promise to take care of your mom or dad means more than keeping them in an environment that may no longer be optimum for them or for you. Take some time to get back on your feet again. Get together with supportive friends and family members. You have been giving loving care to your parent and now it’s time to care for yourself.